Fireworks are just part of the magic of summertime concerts at Hollywood Bowl. Most of the classical music world has a great appreciation for the Los Angeles Philharmonic and with good reason. Its instrumentalists play in top form virtually every night of their yearlong concert season. The Phil’s music and artistic director, Gustavo Dudamel, is one of the most charismatic conductors working today and he has matured significantly in his nine years with the orchestra. Moreover, he is signed through the 2021-22 season. The orchestra’s management has been exemplary and visionary during the past three decades and even though its longtime President and CEO Deborah Borda left this summer to try and work her magic with the New York Phil, the orchestra’s board has two excellent in-house candidates — Gail Samuel and Chad Smith — to replace her, should it so choose. 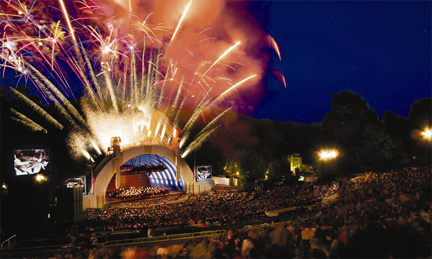 However, one aspect of the Phil’s life remains unique among the nation’s orchestras: Hollywood Bowl, which this season celebrates its 96th year. Tuesday night Dudamel and the Phil opened their 10-week classical season, which contains concerts nearly every Tuesday and Thursday plus a couple of other days as well. Many people, including me, got our first significant exposure to classical music from the Bowl’s “cheap seats.” As usual, the $1 seats are sold out but there are plenty of $8 seats available for some of the classical concerts this season, so that “first exposure” rule still holds true in many respects. However, what makes the Bowl valuable for the Phil is the growing number of pops and movie nights that it hosts each season, numbers that dwarf most of the classical concerts in terms of crowd counts. This weekend Dudamel and the Phil will appear with Tony Bennett and many other pops-style programs will take place this summer. Most, if not all, will draw near the capacity of about 18,000 people. All of these provide a tremendous cash influx for the orchestra and help it to maintain a positive cash flow in its annual budgets while paying its musicians top dollar. The Bowl’s central location is another bonus for the L.A. Phil. The Boston Symphony’s Tanglewood Music Festival takes place each summer, but it 2-3 hours driving west of Boston (into one of the prettiest areas of the country, I’ll grant you). Moreover, its listed seating capacity in its main “shed” is just 5,700, less than a third of the Bowl. If you haven’t visited the Bowl in a season or two, you’ll be surprised at the changes. Each year something is improved — this year it’s a new Main Plaza and enhanced picnicking areas, along with metal detectors to get into the main gate entrance (there’s also a new “mid-gate” entrance that let’s you avoid the crowd at the main gate). If you don’t enjoy the stacked parking on site, there are several alternative forms of transportation, including Park and Ride buses and a shuttle from the Red Line’s Hollywood/Highland station. Particularly this summer when the nights have been unusually warm, it all makes for a quintessential summertime magical experience. Music and Artistic Director Gustavo Dudamel and the Los Angeles Philharmonic conclude their 2016-17 subscription season by completing a cycle revolving around Bartók’s three piano concertos. Yuja Wang will be the soloist in the second concerto on Thursday and Friday and the third concerto Saturday and Sunday. On all four days, the accompanying pieces will be Stravinsky’s Symfonies of Wind Instruments and Janáček’s Sinfonietta. (The first concerto was last week — review link HERE). The long-time Broadway hit musical is the final production in the 2016-2017 McCoy Rigby Entertainment series at the La Mirada Theatre for the Performing Arts. Davis Gaines — one of the most popular performers in the title role of ZZZPhantom of the Opera — stars as the chivalrous knight Don Quixote. Since I’m a member at LCPC (although I’m not singing in this concert) you can take this recommendation with a grain of salt or a pound of salt, as the late, great Molly Ivins used to write. This annual Pops program focues on music and films beloved by children of all ages, including Shrek, Mary Poppins, and Seussical the Musical, among others. The church’s choir and soloists are accompanied by the Jack Lantz Little Big Band; Jack Lantz conducts. Pacific Symphony Pops Conductor Richard Kaufman leads this program of music covering a healthy slice of Williams’ motion picture scoring career. In advance of its summer season at the Los Angeles County Arboretum, the Pasadena Pops offers its annual free concert on the steps of the city’s iconic City Hall. Resident Conductor Larry Blank will lead music from Broadway, Hollywood and the “Great American Songbook,” accompanied by soloists Kiki Ebsen, Valerie Perri and Christina Saffran, as well as the JPL Chorus. BONUS: Free admission; gates open at 6 p.m. The Plaza is easily reachable via Metro’s Gold Line. Exit at the Memorial Park Station walk up three blocks east to reach the City Hall and Centennial Plaza. Music Director Sue Fink leads her choir of 160+ in a program that mixes music from several centuries and genres with elements of cyberspace. The program will feature the premiere of a new song, A Vibration, by Los Angeles-based composer and ACC choir member Andrew Cheeseman. Next performances: Today and tomorrow at 2 p.m.
Yuja Wang was the soloist in Bartók’s Piano Concerto No. 1 with the Los Angeles Philharmonic last night in Walt Disney Concert Hall. As we drove home following the concert at Walt Disney Concert Hall, fireworks blazed in the sky over Dodger Stadium. They paled compared to the fireworks that exploded inside Disney Hall. Music & Artistic Director Gustavo Dudamel and the Los Angeles Philharmonic began a two-week series last night that will conclude the Phil’s 2016-2017 indoor subscription season. 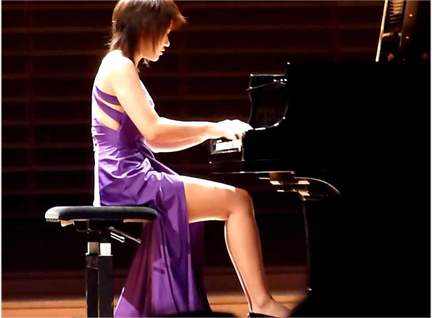 The cycle revolves around the three piano concertos of Bela Bartók, with Yuja Wang as the soloist. Dudamel is surrounding each concerto with music by Igor Stravinsky and Leoš Janáček — this weekend it’s two rarely heard and disparate pieces based on Roman Catholic liturgy: Stravinsky’s Requiem Canticles and Janáček’s Glagolitic Mass. Since her Phil debut at Hollywood Bowl in 2011, Wang has been one of the most enjoyable pianists at Phil concerts and recitals both for her playing and what she wears. In her Los Angeles Times profile of Wang yesterday (LINK), Deborah Vankin wrote: “Wang says she has outgrown some lifestyle choices for which she’s known. Of fashion, once an obsession, she says, ‘Oh, it was a phase.’ ” Based on the long, purple slit dress she wore last night (see photo above), Wang clearly had her tongue in her cheek during the interview. However, as usual, Wang playing was the real story. Although she has performed the Bartók concertos individually during this season, this will mark the first time she will play them in a cycle. Somewhat surprisingly, last night she used a score for the complex, percussive score (given the number of notes, I was glad I wasn’t turning pages). She tore through the music with the virtuosity for which she is well known, pausing along the way to let more delicate passages drip off of her fingers. Dudamel, who also used a score — in fact, for the first time I can remember he used scores on all three of the evening’s pieces — and the Phil were on their rhythmic toes throughout the performance, for which all concerned received an especially lengthy standing ovation. Stravinsky’s Requiem Canticles was the last major work the composer wrote, five years before he died in 1971 (in what was probably a cut-and-past error, the printed program managed to bogey all of Stravinsky’s birth and death information). Although scored for a massive orchestra, chorus and two soloists, Requiem Canticles is just 15 minutes long, uses only 24 lines of the Roman Catholic Requiem liturgy (Stravinsky termed it his “first mini- or pocket-requiem”), and never has the full orchestra playing — often just a few instruments cover the singers. It remains a perplexing work for the hearer, full of the dissonances and serialism that Stravinsky was using at the time. The Los Angeles Master Chorale, which numbered 92 according to the printed program, sang with delicate precision, mezzo-soprano Alisa Kolosova delivered “Lacrimosa” lines with creamy, luxurious tones, and bass Stefan Kocan was properly stentorian in the “Tuba Mirum” section, aided expertly by Principal Trumpet Thomas Hooten. If Requiem Canticles is at the mini-end of the musical scale, Janáček’s Glagolitic Mass stands at the opposite extreme. It was written in 1926 and revised in 1928, the same time frame as the first Bartók piano concerto. Janáček was age 73 at the time and his textual choice remains perplexing. “ ‘The ageing composer [Janáček] had a positive aversion to organized religion, even to churches. He would not go into one even to get out of the rain,’ his niece wrote. ‘The church to me is the essence of death,’ Janáček observed, ‘graves under the flagstones, bones on the altars, all kinds of torture and death in the paintings. The rituals, the prayers, the chants – death and death again! I won’t have anything to do with it. Rather than religious, Janáček conceived the work as a pantheistic, patriotic work, using for the text — instead of Latin — Old Slavonic (whose written characters are in Glagolitic, thus the work’s title). The words were the same Missa Solemnis text used by Beethoven in his Op. 123 work written near the end of his life. Like Requiem Canticles, the Glagolitic Mass is scored for giant-sized orchestra and full chorus, but unlike Stravinsky Janáček uses them in full-throated glory. Dudamel conducted the work with an irresistible swagger, the orchestra’s strings were notable for their lean sound, and the full brass section was glorious throughout. The Master Chorale sang the difficult text superbly. In addition to Kolosova and Kocan, soprano Angela Meade sang gloriously with full operatic fervor, while Ladislav Elgr’s clarion tenor voice soared over the orchestra and chorus with seeming ease. The orchestral score includes a pipe organ and, after the final choral section, Latvian organist Iveta Apkalna put a virtuosic cap on the proceedings using the Disney Hall organ in the “Varhany” solo movement (the word means “organ” in Czech), which concludes with a pedal-solo flourish. The 1928 version has Glagolitic Mass concluding with a short, dramatic orchestral movement, “Intrada,” which preconcert lecturer Eric Bromberger noted might be thought of as a recessional rather than an introit (the original 1926 version had the movement at the beginning). As an organ lover I might have opted for the earlier version.